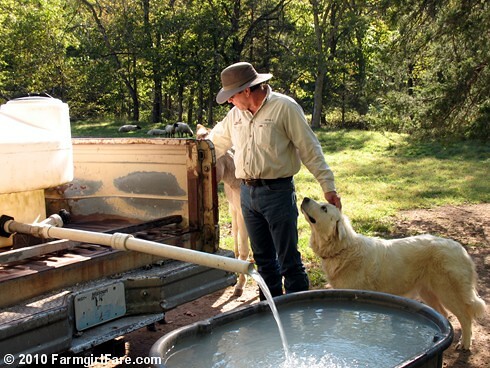 Farmgirl Fare: Friday Dose of Cute: A Man and His Dog. . . When we have animals grazing in Donkeyland, which is located about a quarter mile up the rocky, meandering wet weather creek bed, we have to haul water to them. Once the tank is full, we slowly bump our way out to the 100-gallon Rubbermaid stock tanks sitting at the edge of the field (one of which we fill with cold water in summer and use as a refreshing backyard pool). 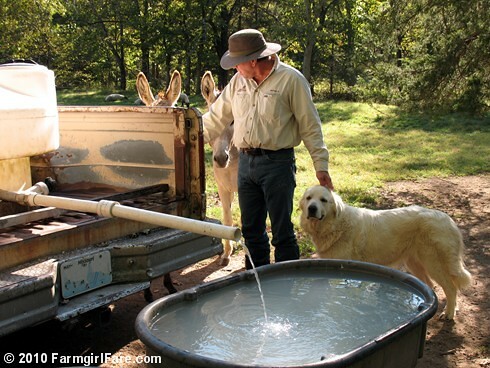 Next to the two tanks are a 5-gallon bucket and a shallow 15-gallon trough filled with water for the sheep and baby donkeys, though some of the taller sheep prefer to strain their necks up and drink out of the big tanks when they're full. Everybody knows that filling these tanks is a hands-free operation. You can see more of the man here. More of the dog here (and how she came to live with us here). And more of the donkeys here and here and here. Baby donkeys are here. 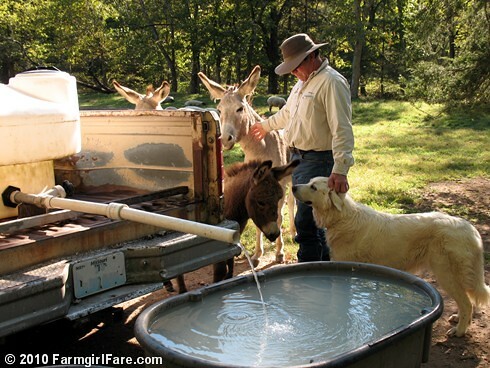 © FarmgirlFare.com, the beck and call foodie farm blog where we don't always feel like we're slaves to quadrupeds—just most some of the time. And Joe would argue that these are all my animals, not his. Thank goodness they're so cute! The 4 leggers are the bosses at our house. I think that's one of your better photos. It tells such a story of those two, and it made me stop and look, 'awww' and smile. Thanks for sharing! Beautiful man! Beautiful animals! Beautiful farm! And you take BEAUTIFUL photos! I needed to see donkeys today...thanks...and happy weekend. That's the closest look of hunky's face I've seen. And... hunky! That is a SERIOUSLY hunky farmguy. A man dressed to work, but taking time to scratch ears on such adorable working animals is so attractive (the donkeys could work, they just choose not to). He looks like a great guy (to match his great wife). The tenderness shown by this small montage of photos speaks volumes on how you live and the peace with which you surround yourselves. Thank you for the glimpse. Wonderful photos...I simply love your blog. Makes me feel good.